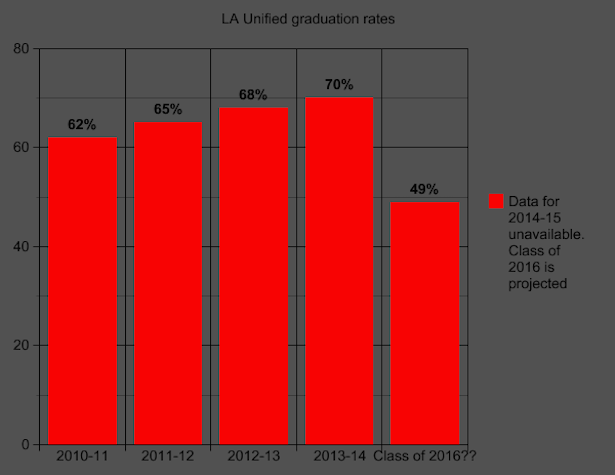 After years of rising graduation rates, LA Unified is facing a stunning reversal this year, with recent estimates showing that no more than 49 percent of seniors are on pace to receive a diploma in 2016. But there may be a chance to avoid the sudden drop. With graduation rates growing steadily over the last four years for which data is available, peaking in 2013-14 at 70 percent, and no major surprises for the class of 2014-15 expected, the class of 2015-16 is facing a true crisis. According to district officials and internal documents obtained by LA School Report, the only real hope to avoid a plunge is successful implementation of new credit recovery programs, which have only just begun in recent months. The credit recovery programs involve seniors who lack enough credits to graduate taking extra classes offered during free periods, after school, on Saturdays and during the upcoming Thanksgiving and winter breaks. In at least two of LA Unified’s six local districts a large number of seniors have already enrolled. “It’s our goal make sure every student who is missing course work in 2016 has an opportunity to take a course,” said Christopher Downing, superintendent of Local District South. How did LA Unified end up heading toward such a dramatic downtown? Essentially, it began in 2005, when the school board passed a resolution raising the bar on graduation requirements. The new requirements, known as A though G, go into effect for the first time for this year’s graduating class and call on students to pass a series of courses that would make them eligible for admission into California’s public universities. The A-G plan also required all students for the class of 2017 to earn a at least a C grade in each course to graduate. Then in June of this year, the board lowered the standard to a D as an effort to improve graduation rates. Meanwhile, the district has embarked on two studies for the future. The June resolution called on the superintendent’s office to develop a long-term plan to go into effect for the 2016-2017 school year, leaving the class of 2016 caught in the middle. An A-G task force also produced a comprehensive report last month, but much of it is broader and long term without immediate solutions for the class of 2016 other than credit recovery. Internal district documents show just how dire the situation may become if the credit recovery programs are not successful: Projections show that in each of the six districts, the A-G completion rate for 2016 would be 50 percent or less. In the spring, Cortines restructured the overall district, creating six local districts and giving them greater autonomy in solving problems, including A-G challenges. “In the spirit of decentralization, the Division of Instruction would like to honor autonomy and innovation by providing each Local District Superintendent with the current A-G data for each school,” reads one document titled Decentralization of the A-G Plan. “It is a little bit more (autonomous), and we appreciate the opportunity to have a nuanced approach. Different local districts chose different paths based on their knowledge of the community,” Downing said. In the South District the plan for credit recovery hinges very strongly on a new online program called Edgenuity. Students will be taking the classes mostly on Saturdays or after school, and it involves either a teacher running the class along with a computer program — known as blended learning — or an all-online course known as virtual learning. Through eight five-hour sessions, students are tested and quizzed in courses they have already taken but did not pass. If they can prove proficiency they receive a “C” grade. In the South, 53 percent, or 2,635 students, are currently off course on A-G completion, but Downing said 1,342 seniors out of approximately 1,500 that are missing six or fewer A-G courses have already signed up for Edgenuity. If even half of the 1,500 students successfully complete the programs they need, it would raise the A-G completion rate to 62 percent in the South. If almost all of them did, it would raise it to around 77 percent. Downing expressed a great deal of optimism that the program would make significant improvements to the 2016 graduation rate. “I had an opportunity to visit five classrooms this weekend, and the students were truly engaged in the work and excited about this opportunity,” he said. In the East district, Gipson said Edgenuity is being implemented on a wide scale, but other credit recovery programs are also being used at a high level. Every senior in the district short of an A-G course has been enrolled in some type of credit recovery program that will be beginning within the next few weeks, Gipson said. With the aggressive credit recovery programs showing so much early success, it does raise one question: Why wasn’t this done before? But that’s a question that spans 10 years, many school board members and several LA Unified superintendents. Gipson, who only was promoted to her role in July, said she didn’t have an answer but is pleased that it is happening now. “As we are coming out of one of the worst financial times in educational history, as a leader I’m happy it is happening now for kids and we can put the resources behind it make sure it happens for kids,” Gipson said.